The Online Etymology Dictionary tells us the word ‘corset’ comes from the Old French word for ‘bodice, ‘tunic’. The modern name of corset as a stiff, supporting, and constricting undergarment dates to c. 1795. The first undergarment that is truly considered to be a corset dates to the first half of the 16th century Spain or Italy. When Catherine de Medici married Henri II, future King of France, she brought the corset with her. The corset in one form or another has been with us since, but by the mid-19th century, physicians and women were rebelling against what some considered a cruel contraption that left women deformed, especially on the inside. What started out as a medical necessity to help physical deformities had become ingrained in fashion, but the evolution of the modern bra had its seeds sown around this time. 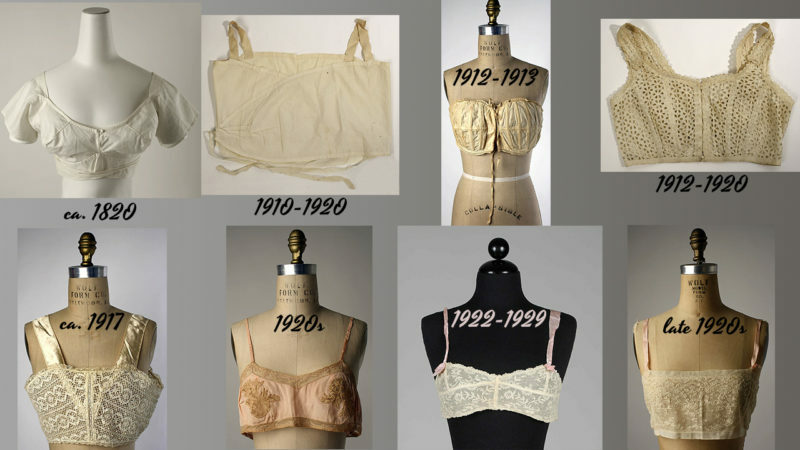 The evolution of the modern bra is somewhat of a bizarre journey. 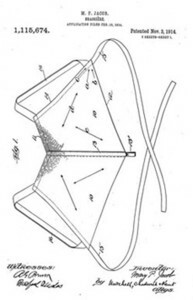 There were many patents relating to bra-like devices issued during the 19th century. One example was found in storage at the Science Museum in London. Kate Weighton of The Sun tells us “the pads were designed to boost the cleavage like a modern Wonderbra, made famous by the 1990s ‘Hello Boys’ ads featuring model Eva Herzigova.” The corset split in 1869, in France. Good Housekeeping describes the garment, called the corselet gorge and designed by Herminie Cadolle, as a corset cut ‘into two separate undergarments – the top supported the breasts by means of straps, while the lower part was a corset for the waist.’ The bra was sold alone staring in 1905. The person who can be credited for the beginning of the bra as we know it today is an American woman named Mary Phelps Jacob, better known as Caresse Crosby. She was a woman of her time and in 1910, at the age of 19, Mary was looking for the proper foundation for a light flowing evening gown. The boning in her corset was visible under the sheer gown. So, with the help of her maid, she sewed together two silk handkerchiefs, using pink ribbon for the straps and cord to wrap around her body. Want to look your best when wearing one of Recollections‘ history-inspired fashions? Here’s a guide to choosing the bra that is right for you.